This entry was posted in Phil, VISIBILITY on March 29, 2013 by pgfeldman. Calculate the BASE (“xxBxxx”) and OCO (“xxJxxx”) using the 3rd letter of the program element. Should be no need to have a button. Change “filter” to “Column Preferences” have all possible columns from Cognos selectable, and reorderable. Of particular importance is Req. Number, which should be a default. Change “filter” to “Column Preferences” have all possible columns from the project data selectable, and reorderable. Printed out and signed InfoTek’s NDA for Dong and myself. Handed them to Athena. More bug hunting. I had to restore from the repository last night after managing to break the event connection where a series is selected. Managed to keep the “configSeriesChanged” change to SeriesSubConfig and SeriesConfigEvent. I also changed the “Apply” and “Done” events sot that they call methods rather than launching the events directly. This should allow some space to reassemble the xml if I can’t manage to do it anywhere else. Should we be switching over to MariaDB? It’s the open-source successor to MySQL, run by the original developer (and team). Here’s why. This entry was posted in Flex Client, Phil, VISIBILITY on March 28, 2013 by pgfeldman. This entry was posted in Flex Client, Phil, VISIBILITY on March 27, 2013 by pgfeldman. This entry was posted in Uncategorized on March 27, 2013 by gvr4wd. problem with quotes and single quotes in xml…. This entry was posted in Dong Shin, VISIBILITY on March 26, 2013 by gvr4wd. This entry was posted in Flex Client, Phil, VISIBILITY on March 26, 2013 by pgfeldman. projects in my Flex workspace have disappeared again, ugh! This entry was posted in Dong Shin, VISIBILITY on March 25, 2013 by gvr4wd. The first big snow of the year in in the Spring. So there. A request for my access extension has been submitted. Yay! Nothing on the certs yet though. Sent Thom Lenny’s FY 12 and FY 13 spreadsheets so he can do a pull. Still need to scan and deploy the bug fix from Friday – done. Done with slideshows. Lenny wasn’t in today, so the new data will have to wait until tomorrow. Came into the office to find that my computers were really only partway through their OS updates. And I’m still waiting on my AV software, which is updating as I write this. Sigh. More tracing of the data corruption bug. I am not sure that this isn’t the result of some linking problems. In attempting to step through SeriesConfig, the debugger is getting completely lost. This entry was posted in Phil, VISIBILITY on March 25, 2013 by pgfeldman. The values for the config are being changed back at some point. They are ok in ColumnSeriesConfig.commitProperties, but by the time the code hits TrendWidget._flexiChartConfig_configApplyHandler(event:FlexiChartEvent):void, the values are wrong. Burned a new disk for the dateFormatter bug. This entry was posted in Flex Client, Phil, VISIBILITY on March 22, 2013 by pgfeldman. This entry was posted in Dong Shin, VISIBILITY on March 21, 2013 by gvr4wd. Flurries this morning. This is soo wrong. Started a ticket for renewing certs for the integration and production servers. Tested out the 6 month data , which everyone liked. Add a column for the variables in the query table. This replaces the variables flag, and will store the variables as key/value pairs in XML. Note that this will always be <String>:<String>. Each query is allowed only one variable object. The python script is able to use new facade methods to write the variables into the slot. set(queryName:String); // finds the appropriate query in the query table. The variable object must be set() before the sql is called. When editing the SQL in the SQL editor, the “raw” query with the substitution tags is shown if the “variables” checkbox is FALSE. The state of the “submit” button tracks the variables checkbox. If the checkbox is TRUE, then the macro substition is run that the query can be submitted. Also, the list of facade methods needs to be made current. This entry was posted in Flex Client, Phil, VISIBILITY on March 21, 2013 by pgfeldman. looked at the queries and scripts, need to get working scripts/queries from site. This entry was posted in Dong Shin, VISIBILITY on March 20, 2013 by gvr4wd. First day of Spring! Brrr! Need to change the scripts for FY12 and FY13 to show only 6 months of history. Possible change to have only bar charts. Still a desire to have something in the horizontal axis that’s legible. Possibly just text. Got the server up and running in eclipse. Most of the remaining problems involved getting jar files to pass through to the final application. In the end, jars used by JavaUtils had to be copied to the test program and exported. Got the Flex code to connect with the debug java server and stepped through things. Found that the classloader was working fine, although it was important to actually copy over the properties files and stick them in the WEB-INF/classes directory in the Juno(Java) project. The classes from all the other sources were merged correctly. Yay. Tomorrow, we create the Flex version component. This entry was posted in Flex Client, Phil, Server, VISIBILITY on March 20, 2013 by pgfeldman. Spent a good part of the morning trying to figure out Keystore again. I need to export a jks file? Working on getting the Tomcat server to run inside of Eclipse. 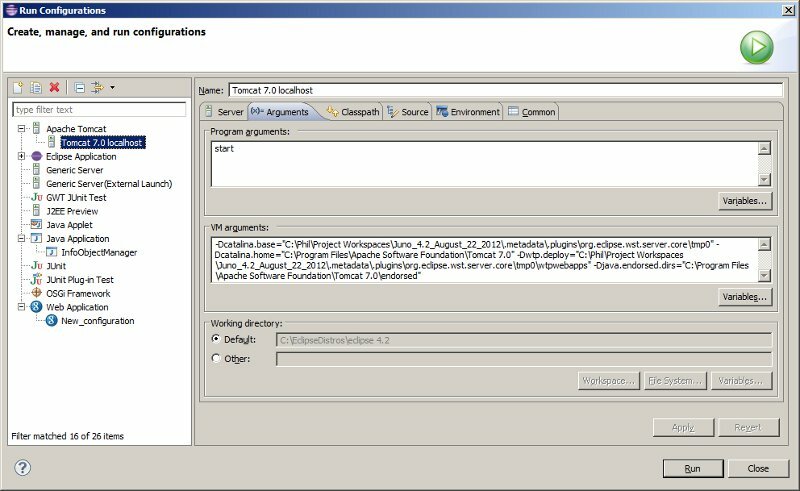 Had to add flex jars and javaUtil classes to the Deployment Assembly dialog in Properties for RemoteObjectTestbed. Had to do it through the QuickFix mechanism in the Problems pane. Adding it directly didn’t seem to work. Also, tried to add the JavaUtils project rather than just the classes, but that didn’t seem to bring along the classes and added warnings about the jar files used to construct JavaUtils. Since they’re needed for logging and such, I’m going to add them? Things are working, but I still can’t get the eclipse server to work with the installed Tomcat location. It’s possible that this could be done using the VM arguments in the Arguments tab of Run Configurations, but I really don’t want to try that yet. This entry was posted in Flex Client, Phil, Server, VISIBILITY on March 19, 2013 by pgfeldman. On the whole, being back at work is much better than watching over your parents at the hospital. Getting a new server cert for the integration machine. Many changes, dead links, etc, but the help is better, and makes more sense. Sent off, though I’m not sure if I go all the people right. Working on getting the server to run in the debugger. So far I’ve had to download updates to all the web tools, and the JST adapters and JST adapter extensions. Updated the HOW TO SET UP ECLIPSE FOR SERVER SIDE JAVA AND CLIENT SIDE FLEX pages to fix a lot of changes since Helios, but can’t seem to connect to the pages – just a bunch of 404s. Calling it a day. This entry was posted in Phil, Server, VISIBILITY on March 18, 2013 by pgfeldman.